Yolanda Wood Pujols: Doctorate of Fine Arts 1994. Bachelor of Art History 1974. 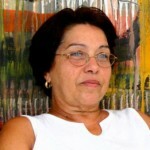 Tenure Profesor of Art History at the school of Liberal Arts, Havana Cuba.